Residents, well, another year has passed. I can’t believe it. In some ways, 2017 went like a flash (don’t you agree)? How are ya? How you doing? 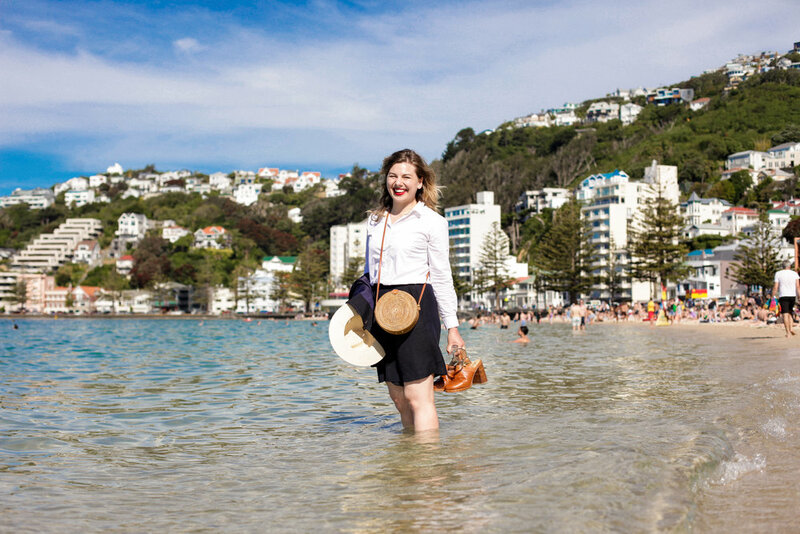 I’ve been a bit quiet lately having a break for Summer and just have been digging it (and this wonderful Wellington weather). What have you been up to on your break? Did you go on holiday somewhere else in New Zealand? Did you go overseas? Did you just stay at home? How is it feeling back at work? We have so much to catch up on. First, I have this gorgeous new website layout, logo and branding from the amazing Emily & Carl at Plankton. I interviewed them last year and loved what they do so much that I asked whether they’d do a refresh with me of my branding. I wanted to stay true to the bones of The Residents, but also give it a lick of paint so to speak. Now my Facebook, YouTube, Twitter and Instagram all have my amazing new logo (see my homepage!). I’d love to know what you think. I have a full blog post coming up next week which will share the process that we went through to achieve the new logo. Next, I have some really cool projects on the horizon which I am very excited about. I can’t share too much yet but honestly, I’m scrunching my toes with happiness when I think of these. Stay tuned on my social media, and keep checking into the blog whenever you can for more. I’m also re-launching my newsletter. It will now be monthly and pack a bit more punch than before, with original content, what I’ve been reading, videos to watch and personal insights you can only get through email. Make sure you sign up to it pronto so you don’t miss out. But before we fully kick off into 2018, I want to take a minute to pause to give myself a pat on the back! I really felt pretty stoked with the year. I did a lot of things that felt like a giant leap (like asking people to pay me! AGH!) but overall it came off pretty damn well. I don’t think I could have poured much more of myself into blogging, really trying my hardest with everything. Equally, I better came to understand the blogging environment in New Zealand and where I buck the trends, for better or for worse. While there were moments of self doubt (more on that in next weeks post), I realised that the people I attract are the ones I truly admire and like, which can only be a good thing. The New Zealand Film Festival, Margaret Hema Skincare, The Fringe Festival, Lux Light Festival and many many more events and people continued to enrich this blog in 2017. But here were some of the real showstoppers. 2017 kicked off to an exciting start with my first ever sponsored collaboration with one of the world’s coolest brands - Allbirds. I mean, how lucky can a girl get? Allbirds are based in San Fransisco and were visiting Wellington for an “Allbirds Fly Away Home” event (possibly I made up that title, not them). Not only was I introduced to the most comfortable sneaker brand in the world but I also got to meet the gorgeous and damn fine Lucy Litman who helped orchestrate the three events and party that Allbirds organised and the co-founder, former All White Tim Brown. I was also very appreciative that Wellington Chocolate Factory suggested me to them. Thanks guys! The next exciting thing happened in June when I was nominated and won an Absolutely Positively Wellingtonian Award and was presented it by none other than the Mayor of Wellington, Justin Lester. I was incredibly honoured to be presented with this, and was positively beaming all night through. The awards also honoured others in Wellington’s community who honestly I don’t even hold a candle too, so that made it even more special. Speaking of Justin Lester, he was one of many amazing Residents I got to interview in 2017. 2016 was pretty epic by way of interviews, but 2017 may have topped it. I sat down with Barnaby Weir from The Black Seeds, Director of ‘My Year With Helen’ Gaylene Preston and the Chief Custodial Officer Neil Beales from The Department of Corrections. And who could forget my best performing interview/fashion shoot with Jaye Glam Morgan? While there are far too many people to individually list, I want to thank everyone who shared their story with me and everyone who liked, commented, and shared those stories, helping to bolster our regional pride with the stories of the real residents of Welly. I also reached 100 residents interviewed, and two years of blogging, both amazing milestones. Sometime around May-August, I found myself working on some really interesting jobs. While I decide what goes on this blog, and I spend lots of time working on it and most of it is free, some paid jobs really helped me this year and I want to thank all of you who read them and shared those posts. Engaging in this kind of content really makes a difference and your support meant I could grow this blog even further. It may be shocking to some of you, but social media growth is getting far more challenging without spending a budget on boosts and sponsoring posts on Instagram and Facebook, largely because of their algorithm changes (RIP chronological Instagram Algorithm - remember when you didn’t see photos 6 days late?). So thanks to all the great people who supported me. It’s really important to have people endorsing blogging because it is a creative skill and I don’t have an editor or boss paying me. I have to hustle my own work and I’m proud when brands chose me to partner with, over the hundreds of other people in the blogosphere. So let’s own it. New Zealand Social Media Awards has to be up there as an experience. I flew up on a red-eye flight and was lucky enough to be nominated as a finalist in the Social Good category. While I lost, I figured that it was the best category to lose in because Attitude, an amazing organisation won. The event itself was a little haphazard (see the searing and yet hilarious review in The Spinoff), it was a night not to be taken too seriously, which ended up at Long Bar in Ponsonby with me unknowingly talking to Luke from Married at First Sight Season 1 (which I was unaware of at that time) and coming away thinking what a lovely gent I’d just encountered after yarning about YouTube (#AucklandLife). A major highlight of 2017 was certainly the honour of hosting two Personal Branding and Influencing events at Biz Dojo, and co-hosting a Wellington on a Plate Event about Food Styling and Social media at Zibbibo. Incredibly, you lot sold out all these events which just goes to show the strong following that we have here on The Residents. The best part for me, apart from meeting you lovely folk, was getting to work with some of my favourite people on these projects, including Lucy Mutch from Crave Cooking School/Wellington Foodies, Ben Woodward, a social media consultant, Rebecca Reed from Arriba PR and Danijela from Healthy Always. Also major props to the team at Biz Dojo because they were so supportive and gave us everything we needed to pull off a great time. Other honourable mentions go to attending New Zealand Fashion Week, getting to be a part of amazing events like Wellington on a Plate dinners, and The New Zealand Film Festival, meeting Carmen Huter, getting to know Healthy Always Danijela Unkovich better (I want to hang out with her 24/7) and Annabelle Wilson from Wilson Trollope, making so many new friends. As I say! I’ve already got some super exciting projects lined up for 2018, which I can’t wait to tell you about. I can’t bloomin’ wait to get cracking. Let’s go, girl *dan dan dan dann-ana dan dan* [Shania remix].